Nitish Kumar on top of the Taxila ruins in Pakistan in 2012. Photo by Sankarshan Thakur. His first chosen partner was, believe you me, the CPI(ML). His current chosen partner is a BJP as approximate to the RSS as it can get. Between them, Nitish Kumar has run the entire political spectrum, picking this one, ditching that one, in the pursuit and possession of power – from the provincial rogue called the Bihar People’s Party to national players like the Congress and the Left, each seduced at one time or another to afford him his embrace of the chair. Nitish’s record of serial dalliance and ditchery springs from good reason, though. For, if power has been the central theme of Nitish’s career, the inability to secure it on his own is its central truth. Astounding as it may sound, the man who is in his third successive term as chief minister and who for a good while fancied himself as prime minister in waiting, has never won his home state singly. At his best he never had enough to propel him anywhere close to office; 17 per cent, never more. He needed booster feeds, he always needed an ally. Not a fanciful token as the CPI(ML) in 1995 – that effort fetched him the princely Assembly tally of seven of 324 seats in pre-Jharkhand Bihar – but a significant, bankable one. He found not one but two. Both would be handed good reason, at different junctures, to believe our chosen headline sits aptly on the man. For he has, at different junctures, found reason to kiss, then kick both. It’s fair to reckon he’s not done with them yet; nor they with him. The guillotine-drop on Lalu Prasad mid-week and the immediate garlanding of Narendra Modi is by no means the last that’s been heard of Nitish Kumar in their annals. Not too far ago in the past, it was Modi under Nitish’s guillotine-drop, and Lalu the one getting the garland. There are scores here that await settlement. Patna, June 14: Either the wind did it or some vandal. But intentional or unintended, man’s mischief or nature’s collateral, it’s a sight whose symbolism would grab even the blind. 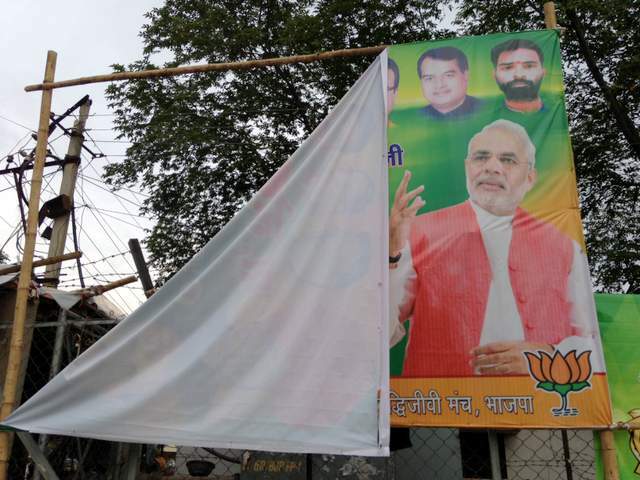 The first big Narendra Modi hoarding to be emblazoned at the BJP headquarters in Patna in the Nitish Kumar years stands ripped down the middle. The face that has brought a 17-year-old alliance to the eve of bitter rupture occupies a beatific space on the half that remains intact: Modi’s. As if it couldn’t care the other half was gone, torn and sundered. Tomorrow’s another day in politics but on today’s evidence, the JD(U)-BJP coalition looks every bit the image of that hoarding — split down the middle under the looming gaze of Modi. Just when and how the last rites will be consummated are probably only a matter of logistics and form. Tomorrow? The day after? In a week? Patna is a thick swirl of speculation, but the inevitability of the break is increasingly not part of any uncertainty. Nitish himself was not flinching from acknowledgement of an endgame. Returning from wrapping up the last leg of his protracted Sewa Yatra outings this afternoon, he called the situation “grim” and requiring of deliberation. Only a fortnight back, in the aftermath of his Maharajgunj defeat, he had brushed off suggestions of trouble in the alliance and labelled it strong. Today, he was prepared to turn sardonic on appeals from BJP leaders to keep the alliance alive in the name of respecting the mandate given to it. “Dua karte hain jaan ki, Dawa jaan lene ki dete hain (they pray for my life, they offer me the potion of death),” he quipped acidly before departing the Patna airport for home. Nitish has been feverishly lobbied by the BJP top brass to hold his horses on the Modi issue, even been told privately that there is no certainty the Gujarat chief minister will become the party’s prime ministerial nominee. But he is unwilling any more to be cajoled or convinced. He is believed to have described some of those offering private assurances on behalf of the BJP as “khaali kartoos (spent cartridges)”. To him, the penny-drop moment was not so much Modi’s naming as campaign committee boss; it was BJP president Rajnath Singh announcing in Goa that the party wanted to see Modi as the “bhaavi neta (future leader)” of the country. “He has seen the writing on the wall, there will be no compromise on this,” a cabinet minister in Nitish’s inner circle said. He mentioned, rather pointedly, that neither Modi nor anybody close to him had made even the “slightest effort” to appeal to the Bihar chief minister, much less allay his apprehensions. What’s left, though, is for Nitish to make good his own high and unequivocally stated claim: that he will not countenance an arrangement by a man he deems communal and, therefore, unacceptable. Nitish has never publicly named Modi as fitting that description but that is political nicety whose veil has now worn thin. Nitish’s zero-tolerance protocol on Modi is well catalogued. He has refused to let the Gujarat chief minister campaign in Bihar. He has shied away from sharing public space with him. In private conversations with BJP interlocutors here and in Delhi, he has never minced his words he will have nothing to do with Modi. It will probably goad him to take his promised plunge. For all its fervent entreaties in the name of the alliance — leader of Opposition in the Lok Sabha Sushma Swaraj became the latest to make a save-our-soul and alliance appeal to Nitish today — the BJP has offered him no credible assurance that Modi will not eventually be named candidate for Prime Minister. Their drift has been quite the opposite: on Modi, there can’t be any compromise. It will probably also goad him that pro-Modi sections in the Bihar BJP and his own cabinet have taken their gloves off and turned belligerent. Almost as if to taunt Nitish, his animal husbandry minister and Modi acolyte, Giriraj Singh, has decided to embark on an official trip to Gujarat, even though BJP ministers are currently on an undeclared pen-down. Nitish’s cry is not unlike: what the BJP has done by foregrounding Narendra Modi is no way for an ally to behave. Not after they knew his mind, not if they wished to keep this alliance alive. Perhaps he has come to a pass where he doesn’t care either how closely his rocked ship resembles that tattered hoarding with Modi looming down.